At Jon & Vinny's in Los Angeles, customers can order a Supreme pizza, a Little Gem lettuce salad and a bottle of 2007 Hubert Lignier Nuits-St-Georges. For delivery. At Jon & Vinny's in Los Angeles, customers can order a Supreme pizza, a Little Gem lettuce salad and a bottle of 2007 Hubert Lignier Nuits-St-Georges. For delivery. That this crackly, charred, wood-fired pie topped with mortadella, mozzarella, provolone piccante and mustard greens ever sees the inside of a delivery car is surprising. That customers can have it with premier cru Burgundy at home on their couch is basically madness. Yet part of the fun of Jon & Vinny's, the new restaurant from chefs Jon Shook and Vinny Dotolo, is actually being there, sitting at the counter, eating that pizza and drinking wine. Watching the two men at work is like witnessing a couple of kids playing pizza shop. Shook is cranking out pies from the Wood Stone oven every four and a half minutes; Dotolo is keeping an eye on the onions in the fryer. The F&W Best New Chefs 2009, known for their hyper-creative food at Animal and Son of a Gun, really, really want everyone to believe that Jon & Vinny's is your basic neighborhood joint. There are meatballs cooking in sauce all day, diner-style plates on paper placemats and special dipping sauces for pizza crusts. "Vinny and I grew up in Florida, and we both remember, after baseball games, going to restaurants with names like Giuseppe's or Manny's," Shook says. "We made this place for our kids." They also made this place for their neighborhood. That's why Jon & Vinny's opens its doors at 8 a.m. to serve breakfast: great coffee, date scones with salted butter, incredible filled Italian doughnuts called bomboloni. People come from all over for lunch and dinner, and not just for the pizza. There are starters like a tuna conserva salad with shishito peppers, pasta dishes made with fresh bucatini and fusilli from the kitchen's hard-working extruder, and other mains like a massive grilled rib eye. And then there's Helen's, the teeny wine shop at the back of Jon & Vinny's. It's run by Helen Johannesen, the director of operations and wine director for all five of Shook and Dotolo's restaurants. A lover of hip-hop, contemporary art, clothes and wines that have a truthfulness about them, she has commandeered a space the size of a walk-in closet and stocked it floor-to-ceiling with bottles she's been buying for years: Burgundies, aged Rhônes, boutique California bottles, natural wines from Italy, prized choices from Corsica. These are highly allocated wines that are typically available only to elite sommeliers or collectors. The back wall at Helen's features 25 or 30 bottles that change each month, following a theme. Regulars use this as their own little wine club. Thanks to a liquor license inherited from the previous occupants of the space, a restaurant from the '60s called Damiano Mr. Pizza, any of these wines can go out with food delivery orders. On a Thursday night, if there's a wall full of rosé and Lil Wayne's "Let the Beat Build" blasting out of a speaker in the ceiling, it only makes sense that the customers at Helen's are going to want to dance. They do all the time. You can watch them from your table in the restaurant—there's a window. "I wanted people to walk in and be enveloped by wine. There's a level of intimacy in there," Johannesen says, sitting under her hot-pink neon helen's sign. "People really like that it feels so private and exclusive." Many customers at Jon & Vinny's have asked to have dinner inside the wine shop, while others drink there while waiting for their tables. It's not rare for diners to have one bottle at dinner and take a couple with them when they go home. Customers sometimes come in just to buy wine. "Yesterday, someone hit up the Rayas hard-core," Johannesen says with pride. It seems the neighborhood is into high-end Châteauneuf-du-Pape, too. 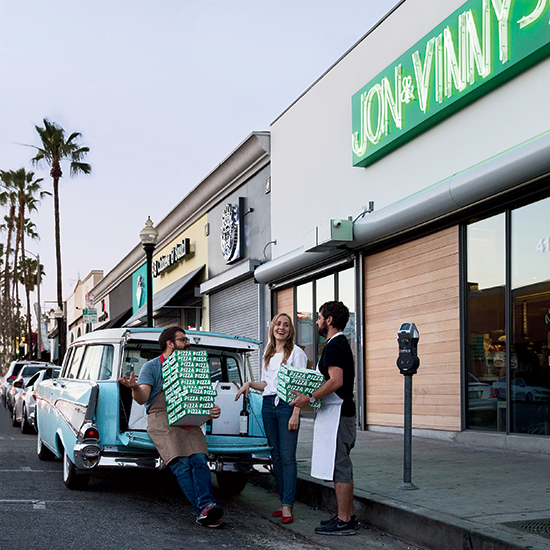 412 N. Fairfax Ave.; jonandvinnys.com. 2013 Mosse Les Bonnes Blanches Anjou Blanc ($38) "This Loire Valley white is a triple threat: clean acidity, roundness, lasting depth. I serve it with a pickled-jalapeño-and-ricotta-topped pizza called White Lightning." 2013 Idlewild Fox Hill Vineyard Barbera ($27) "I like to serve this bright, juicy small-production Cal-Italian Barbera with a slight chill. It's light and has the vibe of a killer Gamay." 2013 Podere Le Boncie Cinque Rosso Di Toscana ($30) "Giovanna Morganti makes masterful wines that are serious yet approachable." 2007 Rovellotti Costa Del Salmino Ghemme Riserva ($58)"Barolo's great all day, but Ghemme in northern Piedmont also produces some amazing ones from Nebbiolo. This has such depth." 2009 Paolo Bea San Valentino Montefalco Rosso ($51) "What I can extrapolate from my nights in a bustling pizza spot is that wines with even a touch of Sangiovese will please most pizza eaters. This biodynamic Umbrian blend is so satisfying."